A stay at Legends Hotel Brighton places you in the heart of Brighton, within a 10-minute walk of Brighton Sea Life Centre and Brighton Royal Pavilion. Featured amenities include express check-out, multilingual staff, and luggage storage. With a stay at Merchiston Residence in Edinburgh, you'll be a 4-minute drive from King's Theatre and 7 minutes from Murrayfield Stadium. Limited parking is available onsite. With a stay at Belvedere Hotel - Adults Only in Blackpool (North Shore), you'll be within a 10-minute drive of Blackpool Pleasure Beach and Blackpool Beach. With a stay at Stanhope Old Hall in Bishop Auckland, you'll be 18.4 mi (29.5 km) from Bowes Museum and 21.9 mi (35.2 km) from Durham University. Free self parking is available onsite. When you stay at Rufford Arms Hotel in Ormskirk, you'll be 11 minutes by car from Longton Brickcroft Nature Reserve. Free self parking is available onsite. Located in Lacock, Red Lion - B&B is a 2-minute drive from Lacock Abbey and 10 minutes from Corsham Court. The front desk is staffed during limited hours. Free self parking is available onsite. Located in Lymington, Britannia House is a 3-minute drive from St Barbe Museum and Art Gallery and 10 minutes from Brockenhurst Manor Golf Club. Free self parking is available onsite. 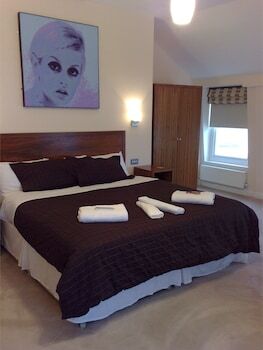 Located in Derby, Old Croft Stables is within a 15-minute drive of Derbyshire County Cricket Club and Derby Cathedral. Free self parking is available onsite. When you stay at Stronavaich Cairngorm Guest House in Ballindalloch, you'll be in a national park and within a 5-minute drive of Lecht Ski Resort. Free self parking is available onsite. With a stay at Llwyn Onn Guest House in Betws-Y-Coed, you'll be 10.8 mi (17.4 km) from Swallow Falls and 14.1 mi (22.7 km) from Dolwyddelan Castle. Free self parking is available onsite.